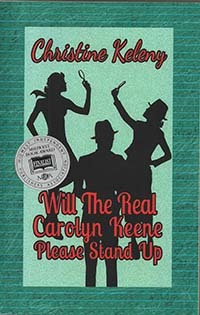 “Will the Real Carolyn Keene Please Stand Up” will surprise and entertain you when it tells of the lives of the three primary creators of the Nancy mystery series and how the plucky, intelligent, resourceful, and famous girl sleuth came to life, along with the controversy that still rages on about who really created the Nancy that millions of readers across the globe have come to know and love. If you didn’t already know, Carolyn Keene, of the famous Nancy mystery series, is not a real person. Neither is the Hardy Boys’ Franklin Dixon or Laura Lee Hope of the Bobbsey Twins. They are all the brain child of one of the country’s most prolific writers for children and young adults to date: Edward Stratemeyer. Edward was so prolific, in fact, that he had to eventually hire ghostwriters to help him flesh out his story ideas, which was not an issue until a series he created just before his death became a cult classic. I grew up reading Nancy Drew books, so I thought this book was GREAT. All about the great characters and the publishing of the great Nancy Drew.